Google’s Duplex technology, where Google Assistant can book an appointment for you by calling and talking to someone as a futuristic robot being, is coming this year to Pixel. Actually, it’s coming next month (November). Duplex should be available as a feature to other Pixel phones. Google hasn’t limited any of Duplex’s announcement to Pixel 3, instead only saying that it’ll arrive next month at restaurants in select cities. Those cities are New York, Atlanta, Phoenix, and San Francisco. They’ll roll it out to more later on. 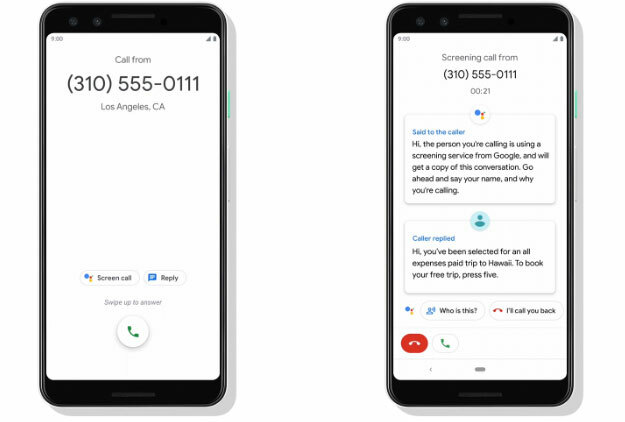 Google showed off a feature called Call Screen for the Pixel 3. It uses the Google Assistant to screen your calls from unwanted spam, jumping in before you ever talk to someone to see if they are a person and not some damn robocall bot. It looks like a super useful feature and you can see a demo of it below. They showed this off on the Pixel 3, but it’s really just a Google Phone app update that arrives in version 24 and up. The support pages (more) for Call Screen do not mention an exclusivity to Pixel 3 and presenters on stage said to expect it on older Pixel phones. Smart Compose is a feature inside of Gmail that uses machine learning to predict what you are about to type and help you write out emails faster. It’s been on desktop for a bit, but it’ll come to mobile first on Pixel 3. It won’t be limited to Pixel 3, though. Google announced that it’s starting there but that it will reach other mobile devices in the beginning of 2019. Google re-branded its AR Stickers app to Playground this week and updated some of its features. Since this is an app that’s already available on the Pixel and Pixel 2, then yeah, it’ll come to those phones under the new name if it hasn’t already. 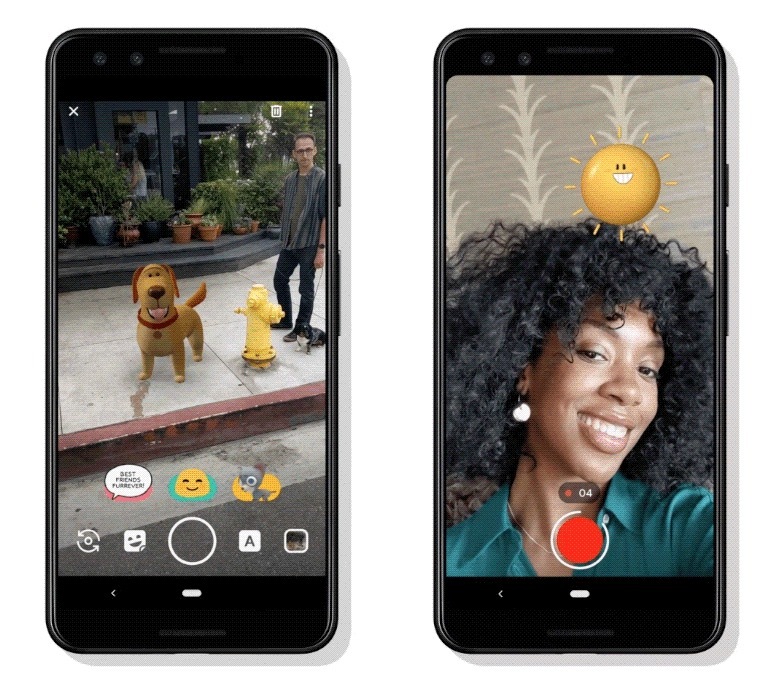 Google is introducing an upgraded Google Lens experience within the Google Camera app on Pixel 3. Using the built-in Pixel Visual Core, they are able to quickly pull information in front of you, like an address or phone number or email address, all without actually opening Lens. Additionally, you can long-press on the camera screen to get into the full Lens experience. Since Google Lens is available on all Pixel phones, some form of this new Lens experience will be available to all of them. However, since Google is using the Pixel Visual Core to do the instant Lens Suggestions, my guess is that only the Pixel 2 will be able to handle that and the Pixel will be left out. Google has said that Lens Suggestions are exclusive to Pixel 3, though. I guess we’ll see for how long. The Pixel 3’s camera is getting a handful of new improvements, like Night Sight, Top Shot, Photobooth mode, and Super Res Zoom. You can read more about all of these at this post. Of those announced, we only know for sure from Google that Night Sight, which is arguably the most important, is coming to the older Pixel phones. The others, we’ll just have to wait and see, but I wouldn’t be surprised if Photobooth and Top Shot both make their way to Pixel and Pixel 2. Google’s Pixel 3 is getting access to depth adjustments for pictures that are taken in portrait mode. You can change focus after the fact and adjust the amount of blur or bokeh. This was announced for the Pixel 3, but it’s coming to Google Photos on devices that support Google’s portrait mode, like the Pixel 2. One of the new features added to Digital Wellbeing is called “Shhh.” When turned on, this puts your phone in do not disturb simply by flipping your phone on its face. They announced this for Pixel 3, but I don’t see any reason why this wouldn’t work on other Pixel phones. My assumption is that it uses the sensors on the front of the device and the gyroscope within to recognize that you’ve flipped it over and want DND. All of those parts are in the Pixel and Pixel 2.